A video wall is basically nothing else than multiple monitors assembled together to form a single large screen. You can use OnSign TV for video walls. The campaign creation process is just about the same as if you were to publish it to a normal screen. There are just two minor things to pay attention: screen resolution and aspect ratio. This is the most basic video wall implementation. The Video Wall Controller is a small box with input options for one or more video feeds. The box will then split your video signal into multiple outputs. Depending on the Video Wall Controller, you can set the output to different formats. Example: 2x2, 3x3, 4x4, 4x1, etc. Professional digital signage monitors have built-in features to help you create video walls. 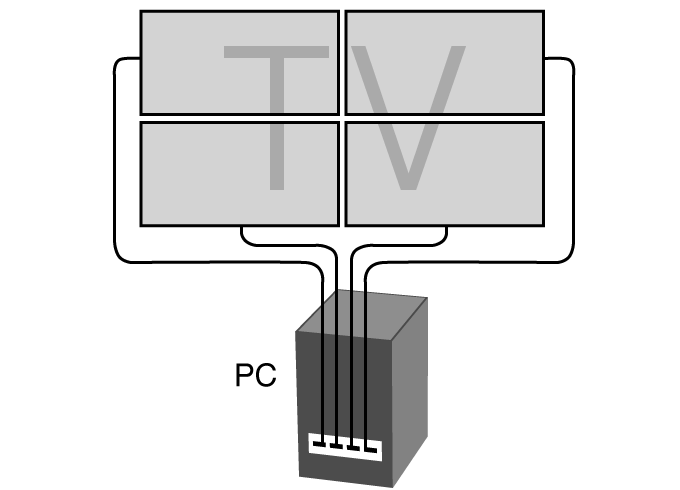 They connect one screen to the other through DVI, HDMI or DisplayPort. This process is called daisy chaining. In addition, each display is configured according to its position on the video wall. 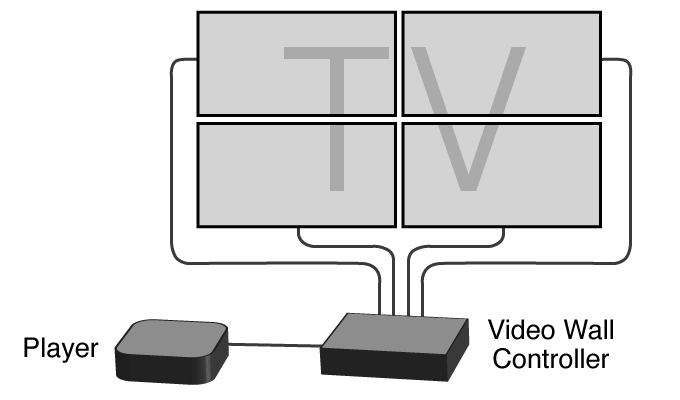 All you need is to connect your player to the first monitor and all TV's will show the corresponding "tiled image" based on your video wall configuration. Maybe the easiest way to build a video wall is by simply adding multiple video cards into your Windows computer used as player. This can be achieved with regular video cards, or in case you want several screens we recommend using professional graphic cards so you can easily add 12 or more screens to a single Windows machine! Install and configure your Windows desktop, so the displays are arranged according to your video wall needs. Now all you need to do is run the OnSign TV Windows Player App. Right-click on the app and select “Toggle Full Screen” and the player will playback the video across all configured screens. You can find different graphic card models on AMD, Matrox and NVIDIA websites.